This section is dedicated to our partners in this solar system. Whether you count 8 or 9 or more planets matters not. Here you'll find close-up photos of planets. Elsewhere you can find wide-field conjunctions. I'm really more of a DSO person, but tonight while I had the scope out, I noticed the Great Red Spot moving across Jupiter's surface. While the GRS can be seen 3 times per day, I had never seen it with my bare eyes. I quickly attached my Celestron NexImage CCD camera and captured some video. 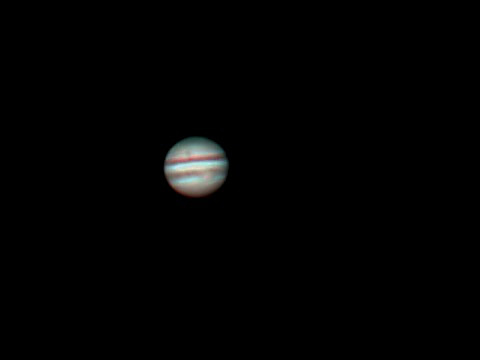 Jupiter is pretty low in the sky at this latitude, so the video was pretty fuzzy, but after processing with Registax it looked... alright. Nothing to write home about, but you can tell it's Jupiter and can see the GRS. After processing, I noticed a 'dot' above the top red band. I checked some software and lo and behold, I also captured Ganymede, the largest of Jupiter's 63 moons. Ganymede is about 1/3 the size of Earth and is bigger than the planet Mercury. This photo gives you some perspective of the size of massive Jupiter - 318 times bigger than Earth.